Making our gardens more resistant to drought is not necessarily about digging them up and starting again, but thinking about appropriate soil cultivation, plant choice and garden maintenance. With careful plant choose it is possible to produce lush-looking gardens even on dry soils. Credit: RHS/Advisory. Why do we need to think about drought? All gardeners, especially those in the south of Britain, need to consider how climate change will affect the plants they grow. Using different plants may mean that the feel of the garden will change, but dramatic plantings can easily be achieved from plants that have very low moisture and maintenance demands. Many drought-resistant plants naturally form communities of plants which all thrive in the same conditions and come from similar Mediterranean habitats. Cultivate the soil deeply and dig in large quantities of organic matter to improve soil structure, soil water retention and water availability for plants. Well-rotted garden compost, mushroom compost, composted bark and well-rotted farmyard manure are all suitable forms of organic matter. Apply sufficient fertiliser as plants use water most efficiently where nutrient levels are adequate. But do not apply too much fertiliser to the soil, as this can encourage too much lush growth which can flop in summer, require extra watering, and become frost damaged in winter. Choose plants with grey-green or silver leaves as they reflect the sun's rays, helping to conserve moisture within the plant tissues. Try to choose plants which suit the site's soil type and aspect. They will be more tolerant of varying climatic conditions as well as of pest and disease problems. Plant things while they are still small. They will develop much greater resilience as they adapt to their conditions from a young age. Ideally plant in autumn so they can do some growing before dry weather arrives. If planting Mediterranean plants, do so in spring when the soil is warming up. Many of these plants will suffer from root-rot if planted in autumn and become cold and damp over winter. Before planting, thoroughly soak the plants in their pots in a bucket of water until the bubbles stop rising to the surface. Thoroughly water in all new plants (and keep them watered in the first season after planting to ensure they establish well). Once established, they will become much more drought-tolerant. 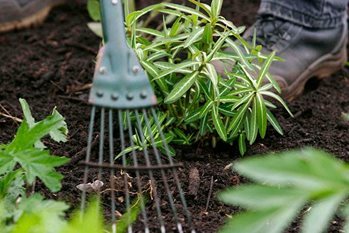 After planting, mulch the bed with 5-7.5cm (2-3in) of gravel or, even better, a layer of compost or straw covered with gravel, to help retain moisture while the plants establish. Consider making a gravel garden. These are low maintenance and are a good option if you already have sandy or gravelly soil. Remove weeds regularly to prevent them depriving your plants of water. You may decide to do without a lawn in your drought-friendly garden, but if you cannot do without this feature in your garden, then you may be pleased to know that lawns are surprisingly drought tolerant, and usually recover well in the autumn rains, even if they have been brown and parched most of the summer. Lawn irrigation should rarely be required, if at all, to keep the grass healthy. Many Mediterranean-type plants can suffer in sudden floods and bursts of heavy rain, which are another forecast feature of our changing climate. The RHS has been carrying out research into this area, to test the tolerance of these plants to flooding in different seasons. View our recent research here.